When you are busy people like Brooks Wilson and Steve Jansson, you may find it hard to release new material as often as they do. 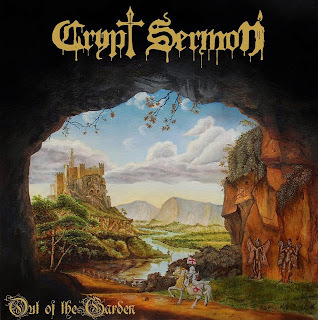 Whether this duo is breaking necks as death metal band Trenchrot, grinding through some Nasum love as Unrest or by paying homage to the forefathers of epic doom metal in their most recent iteration: Crypt Sermon and their debut Out Of The Garden. you are surely to be impressed by the sheer variety of metal showcased by this heavy metal brain trust. Crypt Sermon is different in that it focuses much less on extreme metal but is quite the excellent combination of Messiah Marcolin-era Candlemass, and vocally it hits high points like Ronnie James Dio; with a "foo foo" on album opener "Temple Doors." Guitars soar much like Brooks Wilson's vocals and even sound like they are playing some of Andy LaRocque's leads from Abigail. The album flows from song to song and section to section seamlessly as if you wanted to hear an album that feels like it should be placed chronologically between Nightfall and Ancient Dreams. The epic artwork is something to behold and it really seems to reflect the grand scale on which this album was built; it is quite the piece of art. The pace goes through some ebbs and floes but the overall effect showcases a ton of variety that is crammed into 7 songs just short of 43 minutes. You'll want ot hear this album repeated several times before it all truly "pops". Every nuance has a purpose and it is a shame to miss out on all of it. In the early part of 2015, there have been releases by several huge artists. Not too many of these "no name" bands have broken through, but be sure that Crypt Sermon are one of those bands that seems to be garnering lots of praise. For fans of melodic doom metal with plenty of flair and flourish as well as the obvious ode to the old school, these is much to love on Out Of The Garden and we have another 9 months to decide where to place it among the year's best.